The Symphony of the seas se anuncia como el buque más grande del mundo, aparca cada domingo en Barcelona -entre otros- y está lleno de toboganes, discotecas y muerte prematura para los europeos. (...) Bill Hemmings, marine expert at Brussels-based Transport and Environment group said: “These ships burn as much fuel as whole towns. 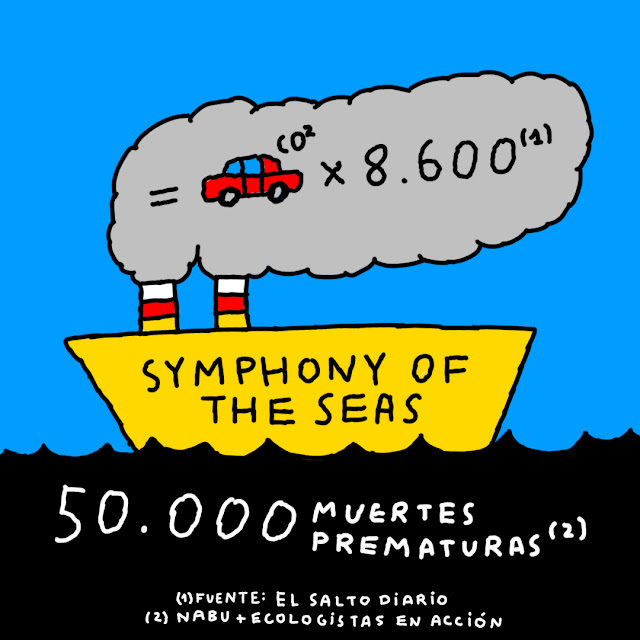 They use a lot more power than container ships and even when they burn low sulphur fuel, it’s 100 times worse than road diesel.” “Air pollution from international shipping accounts for around 50,000 premature deaths per year in Europe alone, at an annual cost to society of more than €58bn [ $65bn],” says the group on its website. Según el salto los que sacan tajada de esto son: el puerto de Barcelona (gestionado por el Estado español), Royal Caribean International, The Vanguard group y Black Rock.